Cribbage Rules: How to Play Cribbage Card Game? Cribbage Rules: How to Play Cribbage? Want to know how to play Cribbage with all the cribbage rules? Try your luck at this most entertaining card game which is played using the cribbage board. Rules of cribbage card game are shared here for your best knowledge and entertainment while you have fun time playing this game of numbers. In spite of being a game of numbers, this card game of cribbage is more about tactics and intuitions. You will meet the set of defined rules for cribbage card game at this article. It is as interesting as spades game. You can also learn spades rules from one of our previous article. Method of how to play cribbage is also elaborated here in a simple manner along with card game rules of other plays like spades rules, phase 10 rules, bridge, canasta rules and crazy eights. The scores in this card game as per cribbage rules are made by combining same value cards. The distinct feature of Cribbage is the Cribbage board which is used to maintain scores. The pegs on the wooden cribbage board help playing with speed and efficiency as Cribbage is a fast game. However you can also use pencil and paper for scoring. How to Play Cribbage Game? Cribbage can be played by two people with a deck of 52 cards in two phases. Hence, recording of points is significant while playing cribbage to check how many scores you have in hand. The game of cribbage is played by counting the scores as per the value of the card. Thus, the Cribbage card game involves lot of calculation of numbers and hence you need to refer these cribbage rules if you are beginner at this card game. The cribbage card game begins with both the player cutting the deck with the player drawing the lowest card becoming the first dealer. The non dealing player is known as pone in cribbage card game. Later on the dealer gets changed alternatively for each hand. During every hand, the entire deck of the cards is shuffled and the pone or non dealer cuts the deck. The dealer player deals six cards with face of the cards down first followed by other player. Rest of the deck is kept in the middle. Each player then picks up the six cards and lays away two hands and the remaining four cards go into the ‘crib’ and forms one hand. The crib belongs to the player who is dealer. The players decide on the four cards to keep and the non-dealing player cuts the remaining cards of the stock. The dealer reveals the top card of the deck which is called starter or upcard. The starter becomes part of three hands. First is dealer’s hand, the non-dealer’s and the hand lying as crib. All the four suits club, hearts, diamonds and spades are considered equal. If the starter is a card of jack, 2 points are scored by the dealer. This score is known as two for his heels. All these scores must be recorded on the cribbage board or note. When the Go interrupts the play, the player who declared ‘Go’ will lead during the further plays with the score count starting from zero. The scores will not be combined with previous played cards for scoring combination. The total cards should never be going beyond 31 number. If it is no possible to add another card without exceeding 31, the player declares “Go” and the other player pegs 1. Once the opponent player gains the point for the ‘Go’ by other player, he can now lay down addition card (below 31). If a player succeeds in reaching 31, he pegs for two scores for the Go. The cribbage board is a rectangular shaped wooden board with pegs and holes. It consists 4 rows, each containing 30 holes. The scores are marked with the pegs. The players should aim to complete the circuits before the other opposing player. 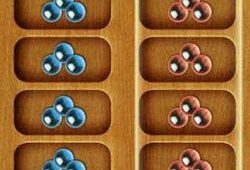 Each earned point takes a one step further to one space and thus a player will need 121 points to complete the objective and win the cribbage game. Two pegs are used to record points one after other. Way of scoring is an integral part of cribbage rules. Find below the number of points during the play of cribbage card game as per cribbage rules. Now you will surely understand how to play cribbage or crib. The game is a fast one based on calculation of scores at different runs and combinations and other terms as per the value of cards and cribbage rules. Do not miss a single card game rules through our website. The cribbage game also includes lots of terms besides rules and regulations. Some of them are pone, Go, flush, pair, crib, two for his heels and run. Though it may seem complicated and lengthy, the cribbage card game and all the cribbage rules are gives best fun when played. The more you are experienced at playing cribbage, the more you will enjoy playing it despite all the rules of cribbage. Do you also play spades, hearts card game, crazy eights and bridge. We have shared interesting information rules of these card games too.